I started this year feeling resolved to make self-care more of a priority. Not a goal or something to achieve and then let slide because it takes too much effort to sustain it but something to be more conscious of and realise in the many small moments in each and every day. For self-care to be something I give more thought to than the habitual routines formed in childhood like brushing my teeth, starting each day with breakfast and looking left and right before stepping into the road. Becoming a Mother has highlighted just how little I do in the way of self-care. I’ve slowly realised that when you’re putting so much of your energy into caring for others it’s all the more important to attend to your own wellbeing. I value the power of modelling positive behaviour so much but this is the one area of my life that is somewhat lacking (I fall asleep in my clothes at least once a week, shower infrequently, stay up too late, let my mood determine what I eat – and those are just the things I’m willing to admit to!). The quote above from L R Knost, one of my favourite parenting authors, sums it up beautifully. When she shared it in a recent Instagram post it spoke to my heart and made me a little watery eyed to realise my self-care does matter if I’m to put my children first without running myself ragged or feeling resentful. 2018 is to be the year of doing more to consciously to fill up my own cup. I’m determined to change my mindset about what time I have available for myself and how I use it. I’m quieting the voice that stops me from starting things if I can’t finish them within the time frame I’d like. I’m ignoring the voice that says ”I need someone to take the children before I can …”. I have one morning a week when I’m child free and have finally started using it as ”me’‘ time in the truest sense of the word. I ignore the washing up, the baskets of clean clothes to put away and the to-do list and focus simply on eating a healthy breakfast after my weekly swim, spending some time journalling and being creative (which is mostly sorting through photos or thinking about what I could do to improve my camera skills as I regularly feel frustrated that the pictures I see in my mind do not end up on my screen). It finally occurred to me that nobody gets better at something without practice and that I need to devote some time to mastering my hobby. This could be as simple as taking my DSLR with me when I go to the park with the boys or experimenting with light and manual settings in the evening. It could also be seeking some advice from other photographers which I plan to do when I treat myself to some 1:1 training with Shane Young Photography for my birthday next week. I’ve noticed I’m quick to find excuses for why I don’t have the time to do these things but as my wise and patient husband keeps reminding me ”you have to make time for the things you enjoy, it’s ok to think of yourself first sometimes”. I’ve started to see the benefit of making time within my day for little moments of quiet reflection, a pause for a few deep breaths, a little stretch here and there while I make a cup of tea. Krista at a Life in Progress recommends making a list of 5 morning and evening rituals as part of her free 30 days to calm programme and I’ve found when I let my evening routine slide because I’m too tired or too distracted by the things that seem so important but really aren’t it’s a sure sign that I’m not looking after myself. For example, the evening ritual that begins ”get into my pyjamas at story time” reduces the likelihood of falling asleep in my clothes later on when L wakes before I’m ready for bed. When I make the time to ‘‘write down 3 things I’m grateful for” it puts me in the right frame of mind for accepting the completion of my day and not turning on the computer for one last job. I’m more likely to ”be in bed by 10pm” when I practice these little rituals and when I do that I certainly remain less effected by a tired, grumpy mood in the morning (I should probably point out that L wakes every 2 hours through the night so decent chunks of sleep are not something I’m blessed with!). Feelings of overwhelm, frustration and general busyness are usually a symptom of not finding small moments of pause in my day to regain perspective rather than the cause of my poor self-care routines. I’ve been pondering these things for a while but it started forming into a blog post after my regular read of Mymamamusings blog. I love how we find inspiration from others and just as Cherie’s posts got me thinking, one of her latest posts was inspired by Mary’s post at The Hearty Life. Mary and Cherie are both taking part in a weekly challenge to notice what they are grateful for, to celebrate something they’ve achieved success with and to recognise the beauty in something. I love the idea of this alongside the fact that committing to share experiences provides a small measure of accountability (my daily journalling commitment stalled at 3 weeks despite my best efforts and recognition of the many benefits it provides!). I thought it would be lovely to jump in with the #myheartylife challenge to give me some focus for a regular practice of writing and reflecting and being a bit braver about sharing my thoughts and experiences. I’ve been umming and ahhhing about whether to continue with my blog as it mostly feels like I whisper into a wind tunnel and I often wonder whether it’s a poor use of my time. But I’ve concluded I love the process of writing and working out my thoughts and if my stories provide connection, comfort or inspiration for just one person then it’s all worth it (thank you to those of you who have let me know you look forward to my new posts appearing in your inbox, it makes my day to hear that). It’s also hard to let go of the effort thats gone into writing 669 posts and I like the idea of my boys looking back through stories of their childhood one day. Tuesday mornings and my husband who makes sure they happen for me. I have a morning off from the school run and swim instead. I think so clearly in the pool breathing so deeply as I swim rhythmically up and down. I eat afterwards and for one day at least find it so easy to make the right food choices to nourish my body and support it in being healthy and strong. I may nap, read, sort photos, message friends,fix lunch for G and I to share while L sleeps. I do the things I don’t feel able to when there are children needing me to Mother them. He never expresses any sense of reluctance or annoyance even if his mind is busy with work deadlines. G embraces the opportunity for 1:1 time with Luca making it easy to enjoy my time guilt free. I’m so grateful for the space he gives me to reconnect with my best self. He says it’s easy to give me this time because he knows how important it is for our family life. I’m grateful I chose to give my heart to such a kind and supportive man. Making a cake for E’s 6th birthday when I’d actually made peace with the fact that I was going to buy a birthday cake (for the first time in his life). Let me explain why this felt like such an achievement. It wasn’t so much a baking triumph as a victory for quiet, calm thought over busy, overwhelmed thinking. I’d decided to buy E a cake on the way back from taking L to a gum session in the morning. I reasoned I’d be trying to fit too much in if I anticipated baking and tidying up in L’s 60-90 minute nap time. I didn’t want to feel annoyed with L if today was the day of the short nap so I calmly accepted a bought cake decorated with sweets was not the end of the world. As it happened I was able to make a cake because G accidentally took the car keys to work. After a momentary panic I decided to walk to the school G was working at to collect the keys and stick with my plan. Thankfully the fresh air and sunshine cleared my thinking and I realised that E’s birthday cake was more important than L’s play that morning and it should be the latter that shifted. As we walked home again with the car keys in my pocket L started pointing vigorously at the gardens on the other side of the road. We spent a happy hour bimbling around, jumping off rocks and running down slopes and when we got home L fell into a blissful sleep for 1.5 hours. The cake was made with great love and enthusiasm and decorated with a mountain of sweets. E loved it just as much as I knew he would and I felt pleased that heart sense had won out. Relationships, those blossoming between my two boys and their youngest cousin Kian, who visited for E’s birthday last week. Kian’s mum is G’s sister and they live in London with her husband, not far from G’s parents. Luca and Kian have probably only seen each other a handful of times (they’re only 1 and 2 years old afterall) but this recent visit really showed how relaxed they are in each others company. I think their close relationship is a reflection of how easy it is for children to trust one another and play when there is an ease between the grown ups who love them both. 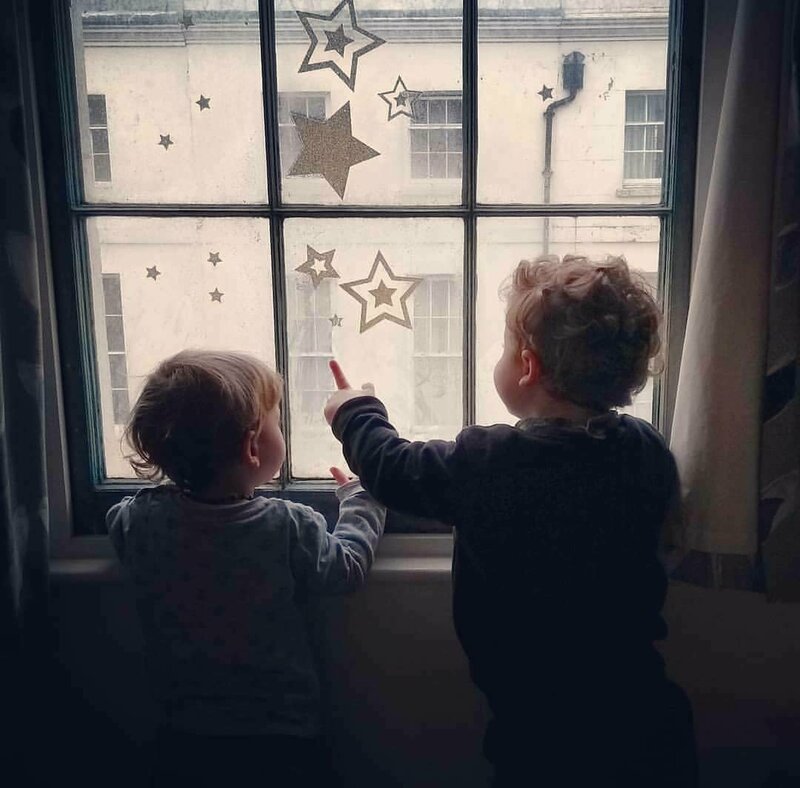 A real lump in the throat moment watching these two looking out the window, K chatting away about the stars on the window and L nodding back. They could almost be brothers. Wow you have such a way with words! This was so inspiring and really touched a nerve for me. Just yesterday I was saying how I need more self care – how most days I’m at my whits end and like you shower less than is probably acceptable, let my mood determine my food and most certainly stay up far too late in a hope of some peace! I love this goal you have and I have made some goals to try better at taking care of me and my mental well-being. This has really motivated me with some ideas! I guess I’d better get thinking about my next #myheartylife post! So glad to see you join this lovely linky and I’ve loved reading about your week. Your Tuesday mornings sound divine and would definitely be my favourite moment of the week. My husband usually lets me have Saturday afternoons to myself but I waste them by sitting and feeling guilty that I’m not with Dex or watching TV. I suspect I may well be the same! I often feel I can’t do things properly unless I have a whole day yet when I did pre-children I wasn’t always that productive. Just having that time to yourself is such a precious thing and it’s an amazing thing that you have a husband who can be supportive to you in that respect as many do not! Pausing is so underrated too and I need to follow this advice more! 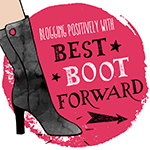 Thank you so much for joining in with #BestBootForward – can’t wait to see more from you!